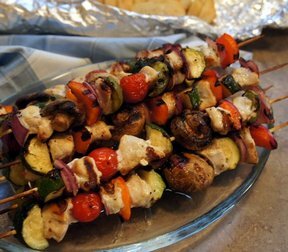 Tasty tidbits of meat and vegetables skewered and grilled. Who even needs a plate! Mix red wine, oil, bay leaf and seasonings in a shallow dish. Reserve about 1/3 of the marinade. Add beef to dish; toss to coat. Refrigerate, covered, for 30 minutes. Preheat grill or broiler. Remove stems, membranes and seeds from bell peppers. Cut peppers and onion into 1" chunks. Drain beef. Discard bay leaf and marinade in dish. 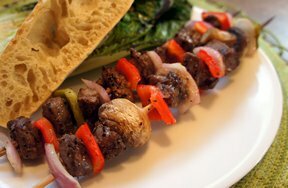 Thread beef, mushrooms, bell peppers and onion alternately onto skewers. 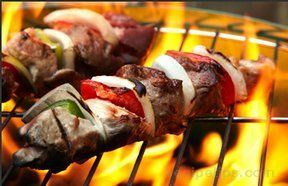 Grill or broil kebabs, frequently coating with reserved marinade, for about 15 minutes for medium doneness. 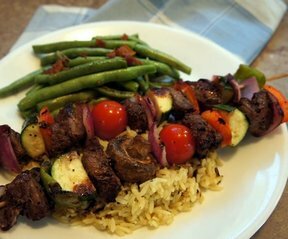 "One of my favorite kebab recipes. I like them best when the vegetables get very grilled around the edges."